Highlight of Real Madrid first Pre-Season Match against Shamrock Rovers. Real Madrid win 1-0 scored by Benzema. Cristiano Ronaldo Has Landed In Dublin With His Real Madrid 'galactico' Team Mates. The most expensive world's footballer Cristiano Ronaldo has landed in Dublin with his Real Madrid 'galactico' team mates for a nine-day training camp. Cristiano Ronaldo, who transferred from Manchester United in a record-breaking 93 million euro Real Madrid summer signing, was part of a 65-strong group who flew in from Madrid shortly after 7pm. Karim Benzema, Ruud Van Nistelrooy, Gabriel Heinze, Wesley Sneijder and Arjen Robben were also among the Real Madrid entourage of world-class players who were whisked away to the luxurious Carton House hotel in Co Kildare after boarding a bus on the runway of Dublin Airport. Meanwhile Klass Jan Huntelaar not with the team. READ MORE - Cristiano Ronaldo Has Landed In Dublin With His Real Madrid 'galactico' Team Mates. The club’s sporting director, Miguel Pardeza, has given a quick run-down of their current status in the transfer market. As Real Madrid prepare to head off to Dublin for their first pre-season tour. 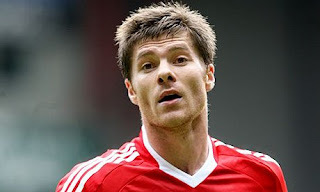 The chase to sign Xabi Alonso has been the hot talking point over the past few weeks. Reports from England informed that the Reds have already started looking for a replacement (Alberto Aquilani) and Liverpool Manager Rafa Benitez has requested a written transfer request, the ‘White House’ hierarchy still not confident of achieving their goal. “Xabi Alonso would do very well at Real Madrid,” Pardeza told Cadena SER programme ‘El Larguero’. Then regarding about Klaas-Jan Huntelaar, who has been left out of the convoy to travel to the Republic of Ireland. “His position is where we have strengthened the most. We have advised him to look for a solution and the player is aware of that,” Pardeza explained. “As such, he decided to stay in Madrid to think of what to do. Finally, Pardeza informed that he is still unsure what will happen to Alvaro Negredo, even though he confirmed that the club had received plenty of tempting offers for his services. He said, “There have been a number of exciting offers for Negredo. He has a lot of competition in his position and it is an issue that must be studied closely. Real Madrid have made a new move for Liverpool star Xabi Alonso using transfer strategies - offering less than they did before. Last week Real Madrid offer £25million for Xabi Alonso was rejected - and their response was to reduce the figure by £3m in a new approach. "Everybody knows that Real Madrid are interested in signing him (Alonso) but it won't be easy," the club's new coach Manuel Pellegrini admitted last night. "We are looking at alternatives for some positions," he added. "The attack is complete and perhaps a central midfielder or full-back is still missing but the rest of the positions are covered." This summer Real Madrid have splashed out a big-spending fortune and this latest effort to get Alonso comes in the wake of reports in Spain that the Anfield star wants the move. It is believed that Alonso have told Liverpool chief Rafa Benitez by phone that he wants to leave. Real Madrid believe that Alonso wants to join them, but this latest transter strategies has only crush relationships between the two clubs. Rafa Benitez knows it hard to replace Alonso, though players like Marseille's Lorik Cana and Standard Leige's Stefan Defour are on his radar. Real Madrid still looking for additional midfielder, but it may not be Cesc Fabregas... It is Xabi Alonso there are looking for. We all know that Real Madrid is loooking for Alonso this summer, but Rafa is the wall. Madrid have tried many times but Rafa... will do his best not to let it happened. "Madrid must not discard an option until it's totally gone," Miguel Pardeza-Madrid's new sporting director is quoted as saying by Reuters. "There is an insurmountable financial barrier at the moment, but it's something that could change. "We're looking at other options, although there aren't many." Madrid's director general Jorge Valdano explained earlier this week that Fabregas is too similar to Kaka in his style for Madrid to need him and Pardeza reiterated that the Arsenal star is not being looked at. "He is a great player, there's no doubt about that, but at this moment he is not a target for Real Madrid," he continued. "The club is working on other alternatives." Karim Benzema was officially Real Madrid Player. He was unveiled today by Real Madrid in front of 15,000 fans at the Real Madrid Santiago Bernabeu. He also speak to the Spanish press and was overjoyed that his childhood dream of playing for los Merengues has come true. You said Ronaldo was your idol. Do you think you can become the new Ronaldo? "I consider Ronaldo to be the best player in the world. He is an inspiration for me. I do not know if I will ever be at his level but he is a player I try to emulate." What did you feel when you were presented? "Real Madrid are an excellent club, one I have dreamed of playing for since I was 14 years old. To arrive here and watch this presentation was one of the reasons why I kissed the club's badge twice. It was a way to reward the greatness of Real Madrid Football Club." Can you promise the club's fans a number of goals? "I hope I will score many goals but I can't promise any numbers. I think scoring goals will be a lot easier with attacking team-mates like Cristiano Ronaldo, Raul and Kaka." You are a close friend of Zinedine Zidane's. Did he play a major role in your signing? "Zidane did not play a decisive role in my signing, but as a symbol of Real Madrid he was obviously important, but the most important person was the president, Florentino Perez." Is it true that when you arrived at Lyon, you told the older brothers you wanted take their places? "I did not say it exactly like that, with that tone. It is true that when you arrive at a team, you are asked to make a public speech, I said I was there to take their place but it was in a friendly tone." What did you feel when you heard 15,000 people roaring your name? "It was a big emotion, I am aware the supporters of the club treat the players in a special way, and I am thankful to them." When you arrive at the Real Madrid dressing room, are you going to make a similar speech? Are you going to say you want Raul's place? "No, no, I have not come for that. I have come to a big club, with big players, I want to learn with them to improve." What did you talk to Pellegrini about when you were with him at the hotel? "It was just a moment, I just saluted him, we will have time to talk about many other things." What do you feel about arriving here? This is an important year, with the World Cup at the end of the season, what does it to mean join Real Madrid in regards to the World Cup? "I am very happy to have signed, it is true that Real Madrid are a different world. Even though Lyon are a big team, this is a totally different thing. About the World Cup, there is a lot of competition, I am in one of the biggest clubs in the world, I do not hope to play every time, I have come here to fight and to work hard and having the World Cup at the end of the year is not a problem." When Florentino Perez went to your home, what did he tell you to convince you to join the team? "He talked about the team, the project he was building, I wanted to come, so he did not have to convince m"e that much, he told me this was a club where they win many titles. We all know your qualities as a football player. But what are the flaws your want to improve on? "All football players have flaws, including myself, I do not know how to emphasise one, what I want to say is that I work a lot, I play with both feet, and I am very ambitious." What do you have that David Villa doesn't? "I do not want to be compared to Villa, he is a great player, one that scores 20-25 goals in the league and that is a remarkable achievement." A lot has been said about Real Madrid's attack, about Kaka, Ronaldo, Raul and yourself. What do you think of Gonzalo Higuain? "I know him, especially because he is someone of my generation, someone very young, what I can say about him is that he is a very good player, who scores many goals per season, a young person, that I am sure will evolve and improve and here we are to be team-mates." What other offers did you have on the table? And didn't it upset you that you were, so to say, Real's second choice, behind David Villa? "There were a lot of clubs that contacted me, Manchester United, Inter Milan, Barcelona, I have come here, I am a young player, I want to adapt to the the team, the environment, to claim a place in the team." You described Villa as a player that scores 20-25 goals per season. Do you see that as the minimum you want to score? "I do not set minimums or make promises but it is obvious that with this team the number of goals can be high." You were presented in a numberless shirt. Is there any particular number you would like to take? "I would like to take number 10 but I obviously have to wait for a number to be free." 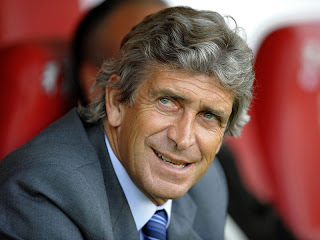 What do you know of Manuel Pellegrini and what do you expect from him? "He is a very good coach, he loves the attacking game, he wants his teams to score many goals. What every player expects of their coach is that he makes them play." You said you dreamed of playing for Real Madrid since you were 14 years old. Was that dream multiplied for having joined with Kaka and Cristiano Ronaldo? I"t is a dream realised to play in a team with these players. What can I say? Two Ballon d'Or winners. What I want is to play and I hope I will grow alongside them." How was your exit from Lyon? I have said it in the past days: I am very happy to be at Real Madrid but also a bit sad to have left Lyon. I hope he will be a good addition to the Real Madrid squad. Real Madrid general director Jorge Valdano has conceded that the club may be not going to sign Franck Ribery from Bayern Munich. Real Madrid and Ribery have mentioned their interest in each other, but Bayern Munich look strongly determined to avoid selling of their most prized diamond. Bayern Munich club are looking €80 million for the France international, a figure Real Madrid find unrealistic. Valdano has now revealed that the club may fail in their attempt to land the 26-year-old this summer, which will result in a new offensive next year. "Ribery has a running contract with The Bavarian, who do not wish to sell him," he told Onda Madrid. "We have to be patient. If it is not this year, it could happen in the next." "The player has demonstrated his desire to play for Real Madrid and we know how to wait. Joining now will be very difficult." Valdano has guaranteed that Real Madrid still plan to bring in players to the current squad. "If more people arrive, we will handle things with more discretion. "Next week I hope we will all start focusing more on football matters and leave the presentations in the background. "We would settle with one or two more midfielders to complete the squad," he added. Around 80,000 Real Madrid fan's at Barnabeu Stadium welcoming Cristiano Ronaldo. "I'm very happy to be here. I've achieved one of my dreams," Ronaldo, who agreed to a six-year deal, said. "I want this to begin as quickly as possible so that I can show what I can do." MADRID: Cristiano Ronaldo has passed his medical test at Real Madrid and is set to be introduced as the club's latest signing, completing a deal that makes him the most expensive player in the world. The 2008 FIFA world player, who spent the past six years at England's Manchester United, arrived in Madrid on Monday on a private flight from his native Portugal where he was on holiday, sparking a media frenzy. In a statement, the head of Real's medical services, Carlos Diez, said the 24-year-old striker was "in perfect condition and looking forward to the beginning of the season." Ronaldo will don Real's jersey for the first time at a ceremony at Santiago Bernabeu Stadium which is scheduled to get underway at 9 pm (1900 GMT). Real acquired the player from Manchester United last month on a six-year deal worth 94 million euros (131 million dollars) and Spanish media reports that he will be paid 13 million euros each season. He will team up with Kaka, the 2007 FIFA world player, who signed with Real from AC Milan for 65 million euros from AC Milan in early June. Kaka was officially unveiled on June 30 at the Bernabeu stadium before 55,000 fans, according to club figures, and Real predicts as many as 80,000 people may attend Ronaldo's presentation. That would make it the most attended presentation of a footballer since 75,000 fans cheered the arrival of Argentina's Diego Maradona at Naples from FC Barcelona in July 1984. Fans had to pay to enter the stadium in that event. By noon hundreds of fans, equipped with food and drinks for a lengthy wait, were already at the stadium waiting for the free event to get underway. "I am here because he is handsome and I am from Madrid," one young female supporter told private television TVE as she sat surrounded by friends outside the stadium waiting for the unveiling to get underway. Sports daily AS reported over the weekend that Ronaldo will wear the Number 9 shirt once sported by club legend Alfredo di Stefano. The Argentine striker, Real's honorary president, is expected to present Ronaldo with his jersey at the player's official unveiling. Kaka was the first big name who construction magnate Florentino Perez signed since he returned in June for a second stint as president of Real. Perez, who brought Luis Figo and Zinedine Zidane to Real during his first term as the club's president between 2000 and 2006, is seeking to rebuild a squad which trailed arch rival FC Barcelona last season by reviving his policy of signing football superstars. READ MORE - Ronaldo passes medical. It's the moment everyone has been waiting for and the picture Madridistas have been dying to capture. Cristiano Ronaldo will sign his contract on Monday and subsequently be presented as a Real Madrid player before thousands of fans. The Santiago Bernabeu is preparing to welcome the Portuguese international following the unveilings of Kaka and Raul Albiol. The whole planet has been eagerly awaiting the day, which will be covered by more than 200 media outlets from every corner of the globe. Twelve national and international press agencies and dozens of sports and general newspapers, specialized magazines and websites will be on hand for the event. Foreign papers including Clarin, L´Equipe, The Independent, A Bola, La Nacion de Chile and The Sun will be there, as will 31 international television channels, including TV Kuwait, Chilevision, BBC, Ecuavisa and RTP. Realmadrid.com and RealmadridTV will also bring you all the day's events, so please stay tuned for what will be a momentous occasion. MADRID — Real Madrid's Cristiano Ronaldo believes he's worth every penny of his record 80 million (C$146 million) pound transfer fee. "I think that it's a fair figure. If Manchester United and Real Madrid agree to this amount, then there is nothing more to say," Ronaldo said in Saturday's edition of Marca. "The great players cost a lot of money, and if you want them you have to pay it. I'm happy to be the most expensive player in the world." Ronaldo said that news of his transfer last month brought an "indescribable" feeling and that he would do all he could to prove his worth on the field. "My objective is to go down in history as one of the best," Ronaldo said. "If I can finish as the best, then perfect. What I want is to be a part of the club of the greatest players in history." The 24-year-old Portugal international was also looking forward to his presentation on Monday, nearly a week after Kaka was introduced to 50,000 fans. The 80,000-seat Santiago Bernabeu stadium is expected to be at full capacity. "It doesn't matter if there are more or less people than at Kaka's presentation. The only important thing I want is to be happy on that day," said Ronaldo, who hasn't decided on a shirt number yet with captain Raul Gonzalez already holding his preferred No. 7 jersey. Madrid president Florentino Perez has spent C$339 million on Ronaldo, Kaka, Lyon striker Karim Benzema and Valencia defender Raul Albiol. Perez's latest "galactico" project isn't finished yet, with more Spanish players promised to arrive while Bayern Munich's Franck Ribery is also a target. "He's building a great team and changing the club's structures," Ronaldo said. "His ideas are very good and he's revolutionized world football with the amount of money he's spent and the signings he's made." Ronaldo had only kind words for Manchester United manager Sir Alex Ferguson, who brought the Portuguese winger to Old Trafford from Sporting in 2003. Ronaldo said he would travel to Manchester in the days after his presentation to show his thanks. "I owe everything that I've learned to him: the way to think, how to adopt certain decisions in my life. He's been fundamental," Ronaldo said. Real Madrid megastar Cristiano Ronaldo is relishing playing in Spain’s Primera Division after six years and countless accolades in the Premier League with Manchester United. The world’s most expensive footballer will be officially unveiled at the Santiago Bernabeu on Monday evening, but before his glittering night of nights, he has joined the eternal argument of which league is currently the best. “The Premier League is a very good competition,” he was quoted as saying on guardian.co.uk, “but I think that the Spanish league is going to have a little more quality because of the players who are arriving. With Los Blancos already having Kaka and Karim Benzema in their ranks while continuing to pursue the likes of Franck Ribery, the rivalry in La Liga will be intense in the 2009-10 campaign, especially with Barcelona looking to bring in Keirrison and Javier Mascherano and Atletico Madrid pursuing Andrea Pirlo. Bayern Munich president Franz Beckenbauer has claimed that Real Madrid don't have enough money to buy Franck Ribery. The Spanish club have already made four signings this summer and have spent nearly €200 million in doing so. 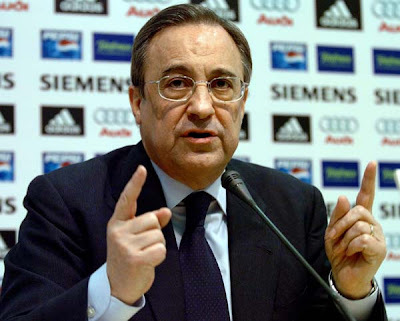 It seems that Florentino Perez is not about to stop now, though, and he said yesterday that he still wants to bring in two more players. Ribery appears to be one of those Madrid are keen on and amidst intense speculation that he will leave Bayern, the Frenchman missed training yesterday. His future at the club now looks to be more in doubt than ever and Beckenbauer did not guarantee he will stay, but simply said finances could be a problem for Madrid. "I cannot imagine that, after the signings last week, Madrid still have enough money left to pay for Ribery," the president told Bild. Perhaps worryingly for Bayern, though, the Spanish giants are not showing any signs of slowing down and still seem to be targetting top players like Ribery. Developments in the next few days with regards to training and Ribery's participation could well show where he wants to be next season. Real Madrid have reportedly offered Alvaro Negredo and cash to Liverpool in exchange for midfielder Xabi Alonso. The previous bids for the Spaniard has been turned down and this is maybe the last option in their pursuit of him. Real Madrid first €24 million bid rejected, then a €35 million bid including Alvaro Arbeloa also has been turned down, this time they are ready to offer the €41 million Liverpool want. 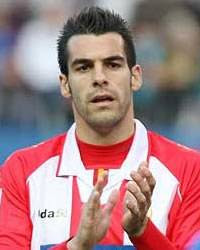 Real Madrid offered not only cash, but also Negredo, who Rafael Benitez has been an admirer of for some time. The Liverpool boss believes that Alvaro Negredo would be an ideal signing to play alongside Fernando Torres and is keen to bring him to Anfield. Juanma Lopez and Alejandro Camano the player's agents, have been in England discussing terms with Liverpool and also Tottenham Hotspur. It is not only the two Premier League clubs, Roma and Genoa are both said to be interested in Negredo and where his future lies is not clear at the moment. 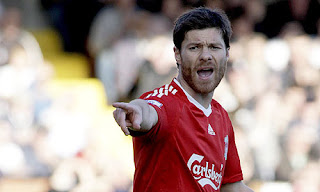 Real Madrid will finally be granted a fair opportunity to negotiate with Liverpool for the transfer of Xabi Alonso. According to AS, the Anfield outfit’s new managing director, Christian Purslow, has told his counterpart in the Spanish capital, Jorge Valdano, to give him a few days before opening formal discussions as he first wants to undertake an extensive revision of the club’s accounts to determine their economic situation and set an appropriate asking price for the midfielder. Rafael Benitez has previously insisted that the 27-year-old would not be going anywhere for less than €40 million, a figure that the 'White House' would not even consider, but Italian newspaper Tuttosport speculated yesterday that the Reds would accept a €32m bid from Madrid. The Spanish sports daily, on the other hand, believes that Purslow, who has been appointed as Liverpool’s chief negotiator in all transfer matters, could settle for a €35 million deal with full-back Alvaro Arbeloa included in the agreement. Los Blancos are reportedly keeping in close contact with Alonso’s agent, Inaki Ibanez, while Valdano is said to have already begun working on a contractual agreement for the Basque-born midfielder. I still cant believe my eyes. I've never seen supporters welcome their club new signing like this before. I'm wondering is it going to be the same when Cristiano Ronaldo presentation at Barnebeu? 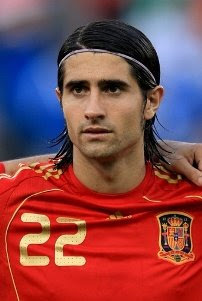 Albiol was born in a small town in Valencia. Rafa Benitez gave him the chance to debut at the age of 18. 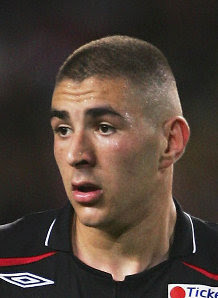 Valencia loaned Albiol to Getafe the following season in order for the player to gain experience in Spain’s top flight. He suffered a serious car accident that same year and his spleen was removed, forcing him to remain inactive for two months. But Albiol made a full recovery and returned to football. He is now an unquestionable starter for La Roja. His list of accolades includes one La Liga, one Copa del Rey, one UEFA Cup and one European Championship. Now Raul Albiol begins a new chapter of his life. Beginning at 21:00 CET when he is officially unveiled in the Santiago Bernabeu, the tall, fast and strong centre back will be new player of Real Madrid. A long day awaits. A magical day is in store. After landing at Terminal 2 of Barajas International Airport from his native Valencia, Albiol expressed how happy he was to be in Madrid and how excited he is to become a Madridista. The player, whoe was joined by his father, wife, brothers and baby daughter, was driven to the Mirasierra Suites Hotel to get a good night's rest before his big day. Raul Albiol passes his mandatory physical this morning prior to being unveiled at 21:00 CET tonight at the Santiago Bernabeu. The player was put through sevaral tests including a biomechanics exam at Sanitas La Moraleja Hospital. According to the Chief of Real Madrid's Medical Services, "Raul is in phenomenal shape. All the results were satisfactory. He is perfectly fit for whatever the coaching staff asks of him. He can begin preseason training with absolute normality." After passing his medical earlier in the day, he went to the Bernabeu and was received by Director General and Presidential Aide Jorge Valdano. Sporting Director Miguel Pardeza and Director of Institutional Relations Emilio Butragueño also welcomed the footballer. Albiol toured the facility and took time out of his hectic schedule to meet several club employees. Despite waking up early for his medical and with a long day ahead, he has yet to wipe the smile off his face. During his visit to the Santiago Bernabeu, Albiol didn't miss out on the chance to overlook the pitch from the Presidential Balcony and greet club employees. Even during one of the most intense days of his life, he managed to fit in a visit to Realmadrid.com, where he took particular interest in how the website is produced and all the news being written about him on his special day. After and interview with Realmadrid TV and a walk around the Santiago Bernabeu, Raul Albiol sat down for lunch with Jorge Valdano, Miguel Pardeza and his agent, Manuel Garcia Quilon. Following lunch, the centre back will be taken back to Mirasierra Suites Hotel to rest before heading back to the stadium at approximately 19:30 for the start of his presentation rituals. Shortly before 20:00, Albiol returned to the Bernabeu to sign his contract and be officially unveiled as a new member of Real Madrid. Raul Albiol is officially a Real Madrid player. The international defender signed a five-year contract alongside president Florentino Perez. The event took place in the Board Room of the Santiago Bernabeu minutes prior to the player’s official presentation on the turf of the Madridista stadium. Also on hand were President of Honor, Alfredo di Stefano, Jorge Valdano, Miguel Pardeza and several Board members. Before entering, Raul commented on the four previous times he had entered the visitors' dressing room. "With Quique, Koeman and twice with Unai. Once for La Liga and the other for the Super Cup," said Albiol. He never made it while playing for Getafe "because I joined the team for the second half of the season and they had already played here." The Santiago Bernabeu hosted its third presentation of the season following that of Manuel Pellegrini and Kaka. This time it was Raul Albiol's turn. Filled with emotion and taking in the momentous occasion, Albiol made his way through the tunnel and appeared before his new fan base. His speech was cut off several times by raucous fans who had gathered for the event. "I will do everything I can to return the confidence that has been placed in me," were the first words out of the new Madridista's mouth. Raul Albiol was clearly delighted about his signing during his first press conference as a Real Madrid player, during which he said that playing for the Club is a dream come true. Wesley Sneijder has pulled a ‘Steve McManaman’ after stubbornly refusing to leave Real Madrid and persistently declaring his desire to fight for his place in the team. According to AS, Los Blancos’ bosses are now ready to consider the option of keeping the 25-year-old at the Santiago Bernabeu after struggling to find a buyer willing to meet the player’s demands as well as dish out €27 million in transfer fees. Madrid had considered including Sneijder in the Kaka deal to lower the mammoth €67 million transaction, but the Dutchman insisted that he had “no intentions to leave Real Madrid”. The ‘White House’ then wanted to offer his services plus €25m to sign Maicon from Inter, a deal that the Nerazzurri supposedly would have accepted, but again Sneijder refused to leave the Spanish capital. And it was no different when Madrid tried to lure Franck Ribery away from Bayern Munich. The German outfit were interested in the Oranje midfielder, but he declared that he did not want to play in the Bundesliga. 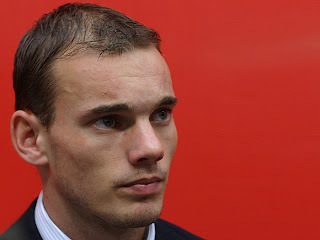 Sneijder joined Los Blancos from Ajax in 2007. He has made 51 league appearances for the Spanish behemoths, tallying 13 goals. The Merengues coach wasn’t afraid to admit he was too busy with his holidays to watch Kaka’s royal welcome at the Bernabeu. As thousands crammed into the Santiago Bernabeu on Tuesday evening and millions more tuned in on television to witness Kaka’s first appearance in the illustrious white shirt of Real Madrid, the team’s new coach, Manuel Pellegrini, decided to give the extravagant show a miss. The ex-Villarreal tactician, currently still on holidays back in Chile, admitted that he did not watch the Brazilian playmaker’s induction fiesta, although he affirmed that it would have been an occasion “worthy” of the player. He assured, however, that missing the presentation doesn’t mean he’s not committed to the club’s cause as he looked ahead to what will be, by a country mile, his biggest managerial challenge yet. “I have the same desire at all the clubs I’ve coached,” he was quoted as saying by AS. “Real Madrid start their season next Friday and they are a club who are more important than any other. Pellegrini will fly back to Madrid on Sunday before kicking off pre-season preparations on July 10. Their first tour will be in Dublin from July 13 to 22, and Shamrock Rovers will have the privilege of becoming the first side to take on the star-studded Blancos. 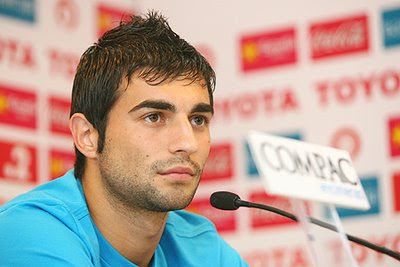 Real Madrid have confirmed that new signing Raul Albiol will be officially presented at the Bernabeu tomorrow. The presentation is due to start at 21:00 CET and the stadium will yet again be open for fans to come and watch as the defender puts on a Madrid shirt for the first time. Only last night the Bernabeu had 50,000 fans inside as Kaka was presented as a Real Madrid player and given his No. 8 top. It is not yet known what number Albiol will wear, but it should be revealed at the presentation tomorrow evening. As well as the defender, Cristiano Ronaldo will also be presented as a Madrid player soon, and Florentino Perez hinted last night that another new signing will be made this week. Rumours this morning were that Karim Benzema has already joined Madrid, but Olympique Lyonnais have denied that a deal has been done. Nevertheless, it looks set to be a busy summer at the Bernabeu and the fans are sure to turn up in their numbers tomorrow evening to show their support for Albiol. 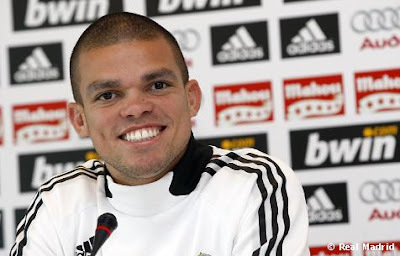 Pepe: "Other teams have reasons to be afraid"
In an interview with Realmadrid Radio, Pepe commented on Kaka's impressive presentation and shared his views on the team's new signings. It was incredible. Kaka had a great reception and I think he's realised where he is. He is a great footballer and we will also give him a warm welcome on the squad. We weren't surprised by the magnitude of the event because we are aware of the greatness of Real Madrid. This crowd is unique and capable of doing such things for a player. I believe Kaka wants to prove his worth on the pitch. He had a great run in the Confederations Cup with Brazil. A new season is about to start and he is going to do his best to help the team. Real Madrid will also help Kaka. Other teams have reasons to be afraid. Kaka is an incredible player, like Cristiano. I think the squad is well-balanced. They are two extraordinary, professional footballers that are ready to help the team. We must show them affection on the squad. The rest is up to them. I watched the presentation and I was slightly envious. I am very happy at this club. I am impressed by the image people have of him because he really is a hard worker that loves football. People sometimes say things about him that aren't true. He is a spectacular guy. Both players know what they are getting into. They will do their best to prove how great they are. I think we have to do a good job and play well. Our new coach has great vision. We must adapt to him as quick as possible. All of us, especially those of us in defence, must learn how to make precise passes to forwards like Ronaldo, Raul or Kaka. They must keep possession throughout most of the game, so we must always be concentrated. I am very happy because people love me over here. I am dying to train again. I am working hard right now to be in top form during the pre-season. He is a great centre back who's done a good job at Valencia and on the Spanish national team. I wish him to adapt to us quickly. Albiol has a very interesting feature; he likes to keep possession and play with the midfielders. That's important in a centre back. He is also rather strong. He has sufficient quality to play on this team and I think he has a bright future ahead of him at Real Madrid. READ MORE - "Kaka's presentation was incredible"
MADRID: Lyon announced on Wednesday the transfer of their France international Karim Benzema to Real Madrid for between ‚35mil and ‚41mil. The deal was reached after Real agreed to up its offer from ‚32mil, the sports newspaper Marca said on its Internet site. Radio Cadena Ser said Benzema will sign a six-year contract with the Spanish giants. This is the fourth signing by Real under the new presidency of “Galacticos” president Florentino Perez, after Brazilian midfielder Kaka, Portuguese winger Cristiano Ronaldo and Spanish defender Raul Albiol. Real are looking for a striker and have been keen on Benzema since negotiations broke down with Valencia for Spanish international David Villa. After a hugely successful presentation ceremony for Kaka at the Santiago Bernabeu, Real Madrid will now move on to their next galactic transfer target. Ahead of Cristiano Ronaldo’s own presentation next week on July 6, Los Blancos are hoping to complete yet another signing, and, according to president Florentino Perez, it could happen any time between the next 24 to 48 hours. 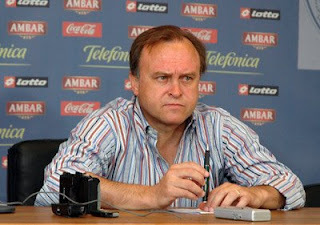 When asked whether it could be David Villa or Diego Forlan, Perez replied, “You are putting me in a tight spot. “I like both of them, but Valencia want to keep Villa and Atletico want Forlan to stay. And if that’s the case we won’t be able to sign either. The ‘Casa Blanca’ chief was then given another opportunity to explain and defend his exorbitant spending, which has drawn worldwide criticism. “The criticism has come from those who are not of Madrid, which is logical,” he explained. “But this is not an expenditure… it’s an investment. Finally, Perez laughed off talks that he is power-hungry and arrogant as he sent out a message to his close rival, Barcelona president Joan Laporta, who has been critical of Madrid’s club model and transfer policies. He said, “It doesn’t bother me. It only motivates me to make an extra effort. Madrid doesn’t belong to any one person. We belong to the members and we have shown a spirit of sacrifice, respect for opponents and fair play. We are closer to humility than arrogance. Karim Benzema has agreed to join Real Madrid from Lyon for an initial fee of £30million that could rise to £35m. The France striker had been top of Sir Alex Ferguson's shopping list as Manchester United sought a replacement for Cristiano Ronaldo. But, despite denials earlier in the day from the French club, Benzema has agreed to follow Ronaldo to the Bernabeu as part of a summer spending spree from the Spanish giants that now stands at almost £180m. The Argentine will not be leaving the Santiago Bernabeu this summer. Juventus and AC Milan have lost out on the opportunity to sign Real Madrid midfielder Fernando Gago, according to Goal.com Italia. During the Merengues' presentation of high-profile signing Kaka on Tuesday evening, sporting director Jorge Valdano revealed that Gago would be remaining at the club and be assigned the number 5 jersey he had asked for. The Argentine has been linked with the two Serie A giants, but it appears they will have to explore other options. It is no secret the Bianconeri are trying to reinforce their central midfield as they have also been tracking Gaetano D'Agostino and Gago's los Blancos team-mate Mahamadou Diarra. Meanwhile, with Chelsea chasing playmaker Andrea Pirlo, the Rossoneri were eyeing the 23-year-old as a potential replacement should their Italian international depart for Stamford Bridge. However, it has been confirmed he will be staying in the Spanish capital. 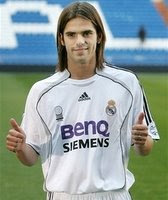 Gago joined Real Madrid in 2007 from Boca Juniors and has made over 90 appearances for the club since that time. Real Madrid midfielder Ruben de la Red will miss the whole of the 2009/10 season as doctors have still not pinned down why he collapsed in a match in October, he said in a newspaper interview published on Wednesday. "What I have doesn't have a name and as of today there is no concrete answer," De la Red, 24, told Marca sports daily, adding he still hoped to make a comeback at some point. The former Spain international was running back towards the halfway line when he suddenly fell face first and lay motionless. He was taken off on a stretcher and regained consciousness in the dressing room but has not played since.